A giant green replica of one of Brighton’s most famous landmarks has been installed to promote plant-based solutions to combatting climate change. 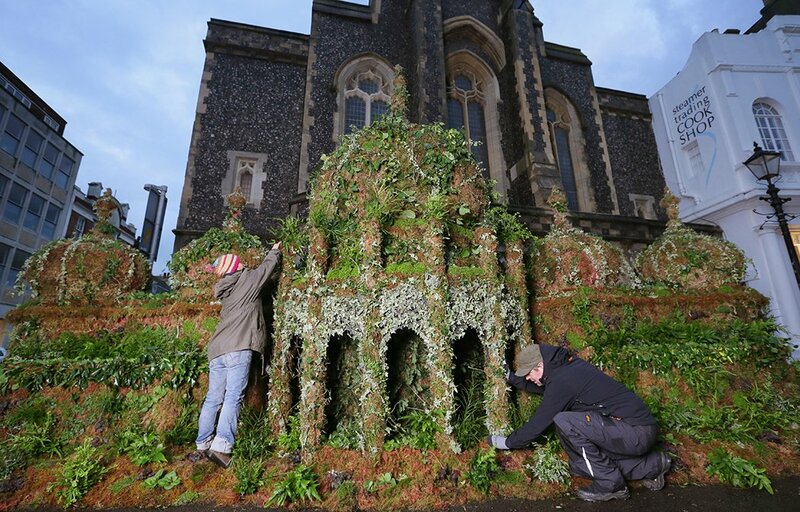 The 12ft Royal Pavilion, which is constructed entirely of plants, was commissioned by Seventh Generation and plant conservation experts Plantlife, to shed light on a recent report which states that the power of plants are not being fairly considered as a means of fighting the effects of climate change. The report, researched by leading scientist, Mark Maslin, reveals that plants have the power to absorb the emissions of every vehicle in the UK, and are as powerful as the majority of the UK going vegan for a year. Planting on just 2% of the UK’s land would absorb the emissions of every vehicle in the UK and would have the same impact as 75% of the country switching to a vegan diet for a year. According to Maslin, restoring biodiverse landscapes in the UK is an essential part of the climate change solution – though this currently takes up just 7% of public discussion around climate change – reflecting a major imbalance at Government level. A new poll, commissioned alongside the report, also reveals powerful public support for plant-based solutions, with a majority (52%) of the 2,000 adults polled voting in favour of paying more tax to restore biodiverse landscapes, and 70% expressing a desire to see greater government funding. The report also reveals that the full potential of plants to help fight climate change is even greater than the Government’s current ambitions and could account for a third (37%) of the required cuts by 2050 under the UK Climate Change Act. This would be achieved through optimum management of bogs, grasslands, arable and horticultural lands, and by increasing forest cover to 18% of the UK. Seventh Generation and Plantlife have created a petition to call on the Government to publish details of its plan to deliver this target in its upcoming Climate Change Bill. Previous articleTravel Today Versus Previous Decades: What Has Changed Drastically?